You know how when you first started your blog, you thought you were going to write about one thing, and over time you've realized you're writing about something entirely different? In the three years I've been blogging, this space went from snore-worthy grammar tips, to writing advice for self-publishing novelists, to a random hodge-podge of thoughts on creativity and writing, to the (kind of) narrow focus I've settled on now: content strategy and the creative process. I've changed my mind a lot over the past few years, but I don't think I'm the only one. It's normal for your blog to evolve over time. You'll hone your voice, discover your true interests, and find the audience you were meant to write for. It's a natural process that's so, so good for you as a blogger. But all those changes can lead to one massively disorganized blog. What are you supposed to do with all those old posts that aren't relevant to your current audience? How the heck do you organize blog posts? And let's not even talk about the hot mess of categories and tags. Blog organization is daunting. Trust me, I know---there's a reason I've been putting off organizing my own blog for more than six months! 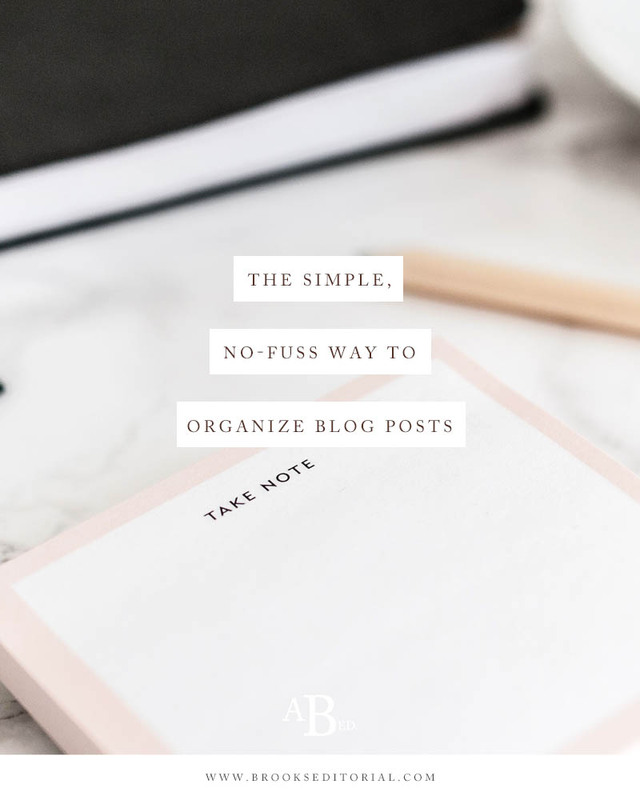 This simple, streamlined process will show you how to organize your blog once and for all. Block off an afternoon for some digital organization, and let's get to work! The simple strategy I use to organize blog posts. First things first, you've got to get those old posts under control. We'll start by clearing out the clutter and then organizing what's left. It hurts to get rid of past posts you worked so hard on. But those boring grammar tips I wrote about in 2012 have no business being on my current blog---even if I'm 99% sure no one will ever read them. Delete any posts that don't offer value to your current audience. You can always save copies if you'd like to go back to them later. Hold onto the high-traffic posts, but update the information to include a call to action that gets those readers interested in what your blog is offering nowadays. Delete the posts anyway. If your blog has evolved far enough, there may not be a good way to turn those visitors into engaged followers who are interested in what you're doing today. If that traffic isn't sticking around for the long term, they're not worth having in the first place. Fact: A blog with disorganized archives (or no archives at all!) is a blog no one will browse through for past posts. Even if someone would love to read more of your blog, they simply aren't going to take the time to scroll through your blog in chronological order! Give readers an archive system that lets them see at a glance which posts they're interested in. Here are some examples from around the web to get you started. Not all archive pages need to be called archives! Regina uses her Start Here page to direct new visitors to her best past posts. Her posts are broken down by category (becoming an inforpreneur, starting or growing a blog, and expanding your coaching/freelancing) so her audience can quickly find the type of information they're looking for. Lauren of Elle & Company lets readers choose how they'd prefer to search her archives page. They can browse by category or keep scrolling to see posts by month. The key here is Lauren's on-brand graphics. They break up the text and make it easy for readers to find what they're looking for. If you have blog posts going back to 2004 (!!) like Problogger does, it's a good idea to include a search bar on your archives page. Readers don't want to scroll through all the posts in the advertising category if they know exactly which one they're looking for. A simple search bar fixes that problem. One thing I HATE about this archive page, however, is the lack of visuals. Take a page from Regina and Lauren instead and make the most of your blog's visual design and blog graphics! Your past posts are shiny and organized. Now you need a simple system that will keep your content organized going forward. Overhaul your categories and tags. They create duplicate tags and categories. They create too many categories. Think of categories as a type of meal (casserole, side dish, bread) and tags as the ingredients. You don't need to categorize a blog post as Blogging and tag it as Blog Tips---it's redundant. Start by deciding on a handful of high-level categories you plan to blog about. For me (ahem, someone who desperately needs to overhaul her own categories and tags! ), my high-level categories should be Content Strategy, Creativity, Blogging, and Creative Entrepreneur. Tags could be things like Creative Process Experiments, Productivity Tips, and Book Reviews. Delete old categories or tags that no longer fit your goals for your blog, and merge duplicate tags or categories into one. Create any new categories that fit the direction your blog is heading nowadays. Use categories as your guide going forward. Our blogs tend to get messy because we start writing outside the boundaries of what our blogs are really about. If you find yourself constantly wanting to create new categories, or putting new posts into categories they don't quite fit into, you need to ask yourself if it's time to take your blog in a new direction---or start a new blog entirely! There's nothing wrong with going out on a limb once in a while, but don't let your blog become a disorganized, unfocused dumping ground. Keeping your topics organized and in line with one another will keep your writing on track and your readers engaged. What's your favorite way to organize your blog? Tell me about it in the comments! Have you lost your blog's focus, and you're not sure how to get it back? A blog content review could be just what the doctor ordered!